The British Museum in London is a national public museum and the first of its kind in the world, located in the Bloomsbury area. Founded in 1753, people can visit the museum for free however special exhibitions usually incur a small fee but are free to members. The number of people who visit the museum has grown to be approximately six million per year, not only from the UK but from across the globe. Its goal is to offer a freely accessible collection to the public and to help cultures understand one another. The museum has a permanent collection of approximately eight million works of art. You will find British art and antiques as well as art and antiques from other countries around the globe, and the collection spans over two million years of the world’s history. It’s not just a place where you can admire objects but engage with them as a way of learning as much about them as possible. The British Museum is located in London in Great Russell Street and is open most days of the year. The only days the museum is closed are 24, 25 and 26 December, 1 January, and Good Friday. Safety is a number one concern for the museum, especially in today’s times. Therefore, bags, packages, rucksacks, and other personal items may be searched before you can enter the museum. The museum is great for individuals, families and school groups. It provides a unique and exciting way to learn about British history as well as the history of cultures from around the world. The British Museum in London offers many free tours and talks. There are daily “eye opener” tours. These are 30 to 40-minute tours that focus on places such as Japan, Africa, China, Ancient Egypt, Ancient Rome, etc. There are 45-minute “lunchtime gallery talks” and 20-minute “spotlight” tours with topics such as The Parthenon and Rosetta Stone. There are even free “hands-on” desks where you can handle some of the objects from the Museum. The museum encourages visitors to take advantage of audio tours, available for a small fee. Listening to an audio tour allows you to learn about an exhibit more profoundly. They are available in 10 languages and you can customise your audio experience, whether by picking certain stops or following themed tours that focus on connections between objects. There is an interactive map to help you find your way and a digital souvenir given to you at the end that shows what you visited. The museum focuses a lot on families as developing an appreciation for art and history is a good thing to learn from a young age. There are family-friendly “activity trails”, “gallery backpacks”, lots of art materials, and more to take advantage of. One of the special programs for families is the “Young Friends” program. It gives children ages 8 to 15 a unique opportunity to experience the museum. For a yearly fee, participants get benefits such as six sleepovers a year, a membership bag, etc. A day at the museum will likely mean that you will get hungry at some point. The British Museum in London has many opportunities to enjoy good food while you visit. There are places such as the Great Court Restaurant or the Court Café, or you can enjoy a pizza at The Pizzeria. Consider becoming a member of the museum to not only support the museum but also to benefit from member extras which include free, unlimited access to all exhibitions, exclusive member lectures, tours, parties, etc., a 10 percent discount in the shops, cafes and restaurants, access to the Members’ room, etc. 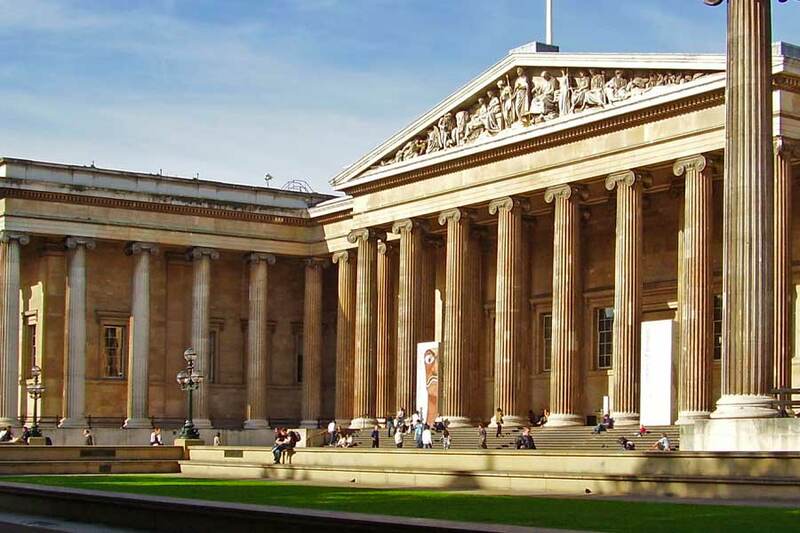 The British Museum in London offers accredited and non-accredited courses in a variety of different subjects. It represents a unique opportunity for higher learning. One of the priorities of a top museum is to continually research and be engaged with what is happening all over the world. The museum’s staff participates in archaeological excavations and studies of objects and works of art. This ensures that the museum is continually taking in new information and relaying that information as effectively as possible to the public. The British Museum is only a 4-minute drive from the Espresso Translations offices. The British Museum in London helps you to learn not only about British history through art and antiques but the history of other cultures. This is done not only by observing art and objects but through lectures, hands-on engagement, information sessions, classes and more. Find out more about other places to see in London, such as the National Gallery.